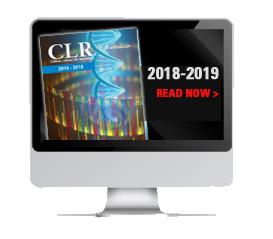 Clinical Laboratory Reference (CLR) is an annual product and service reference guide distributed to over 45,338 subscribers of Medical Laboratory Observer (MLO). It is the industry’s most comprehensive stand-alone sourcebook for today’s medical lab professionals, listing more than 4,900 tests, equipment and services. Pricing: Run a standard 5" listing in print and online (for a full year) for only $1115 net, or expand your listing for $195 per additional inch. A typical 5” listing includes approx. 100 words of text, company contact information, a logo or photo, and up to 50 index categories. Advertisers will receive a proof with the final listing size and rate prior to production. The CLR is mailed along with the August issue of MLO, and it is distributed at industry trade shows throughout the year. Paid CLR print advertisers receive complimentary year-round exposure on www.CLR-online.com. Companies advertising in CLR with a full-page display ad qualify for a free 5” listing in print and online.